Performed since the early 1970’s, laser vision correction procedures improve vision for people with nearsightedness, farsightedness and astigmatism. Laser assisted In-Situ Keratomileusis (LASIK) is an excellent technique for reshaping the surface of the corneas to correct these common vision problems. The goal of surgery is reduce or eliminate the need for glasses and contact lenses. Lasers use light beams that are made from a single color or wavelength of light and which have all of the light rays traveling in the same direction (coherent light). Laser light is not radiation, as are x-rays, cosmic rays and gamma rays. The light itself is safe and does not become effective in medical treatment until it becomes highly concentrated through the use of special mirrors and lenses. Laser light reaches its maximum strength at the focal point, the point where all the rays converge. The strength of the beam rapidly diminishes after passing the focal point, and can no longer affect other tissues in the eye. Instead of using heat to alter tissues like other lasers, an excimer laser beam breaks the bonds that link tissues together with only minimal effect on surrounding tissues. These unique properties allow the excimer laser to be used in the LASIK procedure to reshape corneal tissue. After LASIK, light rays focus more precisely on the retina. A special instrument, called a microkeratome, is applied to the cornea creating a thin flap of corneal tissue. The flap remains attached to the eye at one end. Next, the laser is used to reshape the cornea. A computer, programmed by the doctor for each person’s own correction factors, controls the laser and the reshaping of the corneas. The procedure is performed while the patient lies on his/her back. In treating myopia the laser segment of the procedure starts with a narrow diameter beam. As the laser beam expands or moves, a tiny lens-shaped disc is created. The focal point of the beam only penetrates the cornea about two-thousandths of an inch (about half the thickness of a human hair). Only a small area in the center of the cornea is treated, essentially producing a concave lens over the visual axis. Finally, the corneal flap is replaced (without stitches) and the LASIK procedure is complete. The flap is then replaced and allowed to heal. No stitches are necessary. What should I expect after LASIK? After LASIK, the majority of people are able to pass a driver’s license test without glasses or contacts. Many patients report an immediate improvement within the first day. For others, vision may be blurry during the healing period. Since an individual’s situation, healing powers and tissues are unique, not everyone should expect to achieve full visual correction. People with high to severe levels of myopia or astigmatism may require another procedure to achieve the desired results. People with extremely strong glasses for example, may end up with significant corrections, but still need mile to moderate strength lenses part of the time for some activities. Is LASIK an outpatient surgery? Yes, LASIK is done on an outpatient basis. An “eye drop” anesthetic is used to numb the eye for painless surgery. LASIK normally takes less than 30 minutes and the patient leaves shortly after the procedure. An eye patch may be placed on the eye for temporary protection and to keep you from rubbing your eye in your sleep. Medication drops are used for pain relief, to prevent infection and promote healing. After LASIK, patients usually return to their normal lifestyle quickly with very few restrictions during the short healing period. How would I know if LASIK is the right choice for me? To be eligible for LASIK the eye must be in good health and vision must be stable. However, some people are better candidates than others and consultation with Dr. Paul Griffey prior to surgery is important to determine your estimated benefits of LASIK and any possible complication. How do I get started if I am interested in Laser Vision Correction? If you are reading this web page, you’re well on your way. The next step is to call us for an appointment. 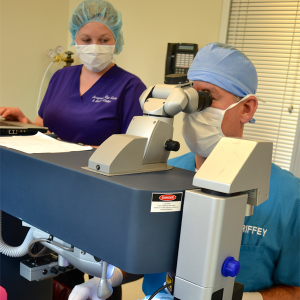 A Comprehensive Eye Exam with Dr. Paul Griffey will take about one hour, and will specifically determine your chances for success with surgery. The eye exam consists of a thorough evaluation and analysis of your eyes and your visual system. You will have time to have all of your questions answered by the doctor.